If you simply use the CrashPlan software without a CrashPlan account you can backup your data to a secondary drive on your computer, another computer on your home network, and to your friend’s/brother’s/mom’s computer all for free—don’t worry the data is encrypted via the Blowfish algorithm. Want to add cloud-based storage into that? You can backup 2-10 computers for a mere $10 a month with unlimited storage—it’s an outrageous bargain compared to other cloud-based storage solutions. For this tutorial we’re going to focus on using your friend’s computer for remote storage; even if you intend to use CrashPlan for local/network backups reading through the guide will give you a solid look at CrashPlan and the menu system. 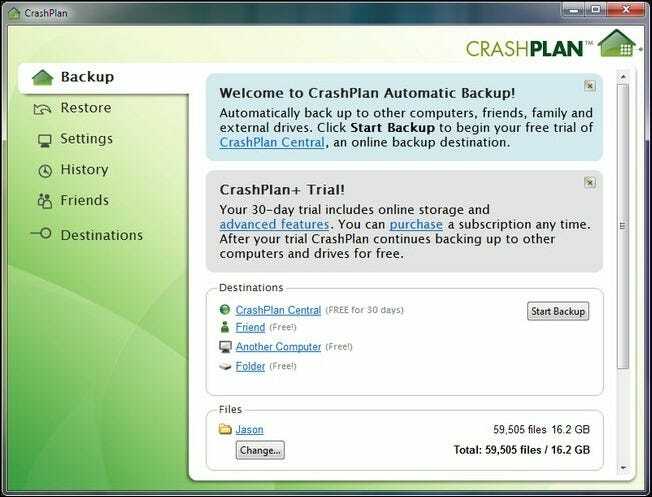 A copy of CrashPlan for Windows, Linux, or Mac. Again, we’re focusing on using your friend’s computer as a remote backup location. If you lack for a friend willing to share some hard drive space and/or their broadband connection you can easily follow this tutorial to do the backing up over the local network. It might seem a bit sluggish for the first minute or so as it scans for files. By default it check your user directory and indexes the files there. You can easily subtract or add drives/folders to your backup. For this guide we’re going to cut down on the size of the backup considerably so we don’t have to wait for all 16.2 GB in our user folder to seed. The size of your remote backup is limited only by your broadband speed and the space your friend is willing to share. Depending on how large the original sweep was you may want to reconfigure the size of your backup before dumping it to your friend’s computer. Look at the bottom of the interface in the Files section and click Change. There you’ll find a directory list with your entire User directory checked. If your backup size is reasonable you can leave it as is. If it captured a lot of bulky directories (like your entire MP3 collection for instance) you might want to opt to locally backup your music instead of chewing up the time and bandwidth transferring it all to your friend’s computer. As we mentioned above, we opted to reduce the number of files for our tutorial in order to avoid a lengthy seed time. Here you can get your backup code (to share with a friend who wants to backup to your computer) or plug in the code they’ve sent you. We’ll presume that you’ve already cleared this backup-sharing plan with your friend or relative and have their code on hand (and thus can skip the invitation step). Your files are now stored on the remote machine, a veritable Poor Man’s Cloud Storage. It’s worth noting here that if your total backup size is small (say, a few GBs of documents and photos) it’s worth it to set up this arrangement with multiple friends. You’ll backup their documents and in turn you’ll be able to spread your documents and such across even more remote locations. CrashPlan is astoundingly simple to set up, as we saw in the above tutorial steps (in a mere handful of mouse clicks you can set up a remote backup). There are a few things you’re going to want to tweak, however, to take full advantage of the application. The first thing you’ll want to customize are the Backup Sets. Click on Settings –> Backup Sets. Here you’ll see the original backup set you created, labeled Default. The Backup Sets feature allows you to create individual backup sets for different scenarios. 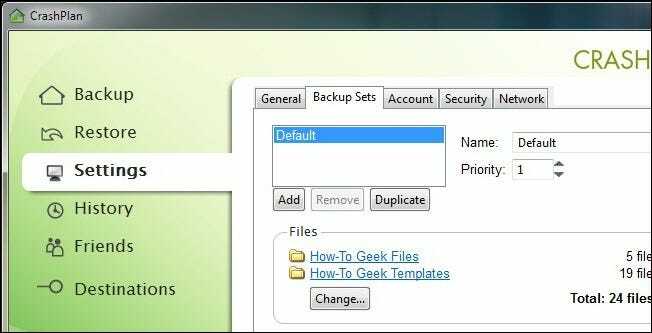 You can create a backup set that is just your critical documents to backup to a friend’s computer who doesn’t have much room to spare, a more generous set for another friend who has a home server with ample space, and yet another (and more complete set) for backup to your local USB drive. Each Backup Set can be independently configured and assigned to your unique backup locations. In addition to configuring your backup sets you’ll also want to head over to Settings –> Network. The default settings for transfer speeds may be a bit weak for your taste. The software tends to error on the conservative side. If you’re running backups up at night without any other apps competing for bandwidth you’ll likely want to raise the upload speeds. Finally, if you’re hosting backups for a friend you’ll want to put the backups on the most suitable drive. By default the backups are stored on the disk you installed the application to. You can change this by going to Settings –> General –> Configure, and switching the Default backup archive location at the bottom of the Inbound Backup Settings menu. This is definitely a step worth sharing with your friends so they can pick an optimal drive to store the backups you’re sending their way.